Well the course that fits this description is none other that the Singha’s beer fame, Khun Santi’s, Santiburi Samui Country Club. This slice of golf heaven on the northern coast of Koh Samui is surrounded by the beauty of the southern Gulf of Thailand and is an oasis of pleasure and pain. Read on! Cool ocean breezes and soaring mountain peaks form a golf course like no other in Thailand. While the modern world and its pressures are long a thing of the past when playing at Santiburi (pleasure), world-class golf under championship conditions make for a truly challenging 18 holes (pain). The Santiburi clubhouse provides for appropriate luxury and comfort that one expects from a championship golf club. But the real treat is the golf course itself. From the 462 yard opening hole that plays up into the jungle, through to the final 442 yard par 4 that soars over the Gulf of Thailand, Santiburi is a sight to behold and a course to be reckoned with. Koh Samui is not normally considered a Thailand golf destination so the course does not get much play, even in the high season. 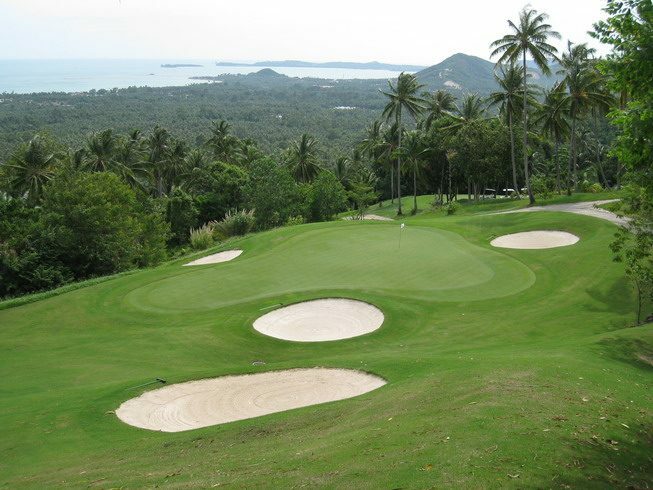 However, if you normally go to Phuket, you owe it to yourself to play at this gem once or maybe even a few times. In any case, you will not be disappointed, but be sure to bring a few extra balls!